무영탑은 1955년 '여성국악단 '에 의해 초연되었으나 그 대본이 유실되었다. 여성국극배우이자 연출가인 김혜리가 기억에 의존하여 대본을 다시 썼고, 1987년, 임춘앵 추모제에서 재공연되었다. 모든 것이 멋으로 이루어 져야해. 멋으로. 무대에서, 여성국극 무대에서, 남자주연이라고 하는것은, 이게.. 굉장히..특히나... 이 작품에서는, 굉장히 유연하고 부드러워야 돼. 만일 다른 작품이었다면.. 걸음걸이도..점점 남자답게 걸어 들어와야하고 춤을 춰도 딱… 이렇게 춰야 되겠지만. 지금 이작품에선 그게 아니잖아. 순전히 마음으로 느끼고, 정신으로 느끼고. 남자주연은, 가도 마음이 먼저. 눈이 먼저, 그게 남자주연의 여성국극 무대에서 .. 의, 남자주연의 기본이야. 기본. 언제나 마음이 먼저. 눈이 먼저. 이렇게 가서 몸이 따라와야해. 이렇게 따라와야지. 근데 또, 이렇게 멋대가리없이..이렇게 해가지고.. 그냥 떡떡떡… 이러는 건 또 안되지. 들어갈때.. 눈과. 가슴과. 이 온 몸이. 그냥 거기에 빨려 들어가는 그런 것을 아사달이 표현을 해줘야해. 아사달 뿐만이 아니라. ..여성국극무대에서 남자주연. 남자주연으로서의 품위를 지키고, 멋을 드러내고. 그러는 동작이 굉장이 어렵다는 얘기지. 더더구나 이 작품에서 아사달은 더 그게 필요하고.. 다른 작품 같으면은, 막 칼싸움도 하고..그러잖아…여자들이 칼싸움 잘했지…묘기에 가깝게 칼싸움을 잘했지. 그런작품은 어…주몽같은.. 동명성왕..주몽같은 이런 역할이 만일 남자 주연이었으면 그건 진짜 활달해야해. 동작도 크고.. 막 하늘을 우러러 부르짖고. 응… 활을 잡아도.. 온-몸의 힘을 다해서 화살을 잡아서..탁.. 놓는것도 기냥 놓는게 아니야.. 온 손끝에 힘이 가가지고 탁… 놓고..아주.. 이런 기개가 필요한 것이 주몽같은 역할이라면..... 그러나 그것도 너무 세게 하면 남자주연 맛이 안나지. 아사달은, 정말 미남이고, 정말 빼어난 예술간데.. 그대신에 .. 다른 무대에서처럼 막 어깨를 겨루고 멋을 내는 그런 역할은 아니거든. 그니까 이 마음속으로 온 정열을 불태워서, 석가탑을 맨들고 다보탑을 맨드는, 그 예술가적 기질. 그 예술 혼. 그것이 아사달에게는 필요한 거거든. 아주.. 유하고 부드러우면서도 자기가 만드는 탑을 볼때는 두 눈에서 막 불이 튀는. 자기는 마누라가 있는데도 불구하고, 구슬아기가 나한테 반해서 자꾸 찾아온다. 그럴때의 그 번뇌. 아사달의 번뇌.너무 좋은데... 좋아도 좋다고 할 수 없는 남자로서의 번민. 저쪽에서 막.. 불꽃이 타올라. 자기 마누라는 어디로 갔는지.. 죽었을 거라고 온동네 사람들이 막 그러고.. 막 헤메다가.. 이거를 자꾸.. 어드메로 옮겨놀고..
댕댕 종이 울렸어.. 귀신에 홀린듯이 그쪽을 바라봐. 막 불이 타.. 구슬아기… 하고 그쪽을 쫒아가서.. 그쪽을 보고..
아사녀 본처는, 물에 빠져 죽었고. 사랑하는 여자는 저기 지금 불타고 있고. 기도안차지. 응..
주저앉아서 아사녀의 시체를 부여안고 자기가 신혼생활의 자기 아사녀와 같이 지내던 신혼의 몸짓을 하는거야. 이 시체를 부더안고 입도 맞춰보고 얼굴도 쓰다듬고, 그 시체 위에 올라가서 이쪽으로 팔을 탁 집어넣고 이쪽에 팔베게를 해서 아사녀를 뉘어가지고.. 여기저기... 어쩔 줄 모르고 있을때, 음악소리가.. 막.. 효과가 나..대금소리가.. 삐리리-이이..
막 나면은 아사달이 여기서 인제 아사녀를 데리고 그렇게 울다가. … 일어나. 딱 일어나서 호수를 보면은 거기에 석가탑 모양이 탁.. 비치는거야… 막 흔들리면서……그러면 이 아사달이 그쪽으로 가서…. 석가탑 속에 아사녀의 그림자가…막… 물속에서 흔들리고…그러면…. (합창)높은사랑, 맑은 사랑 하늘보다 넓은 사랑, 바다보다 맑은 사랑, 사랑, 석가탑에 얽히었네…. Mooyoungtab was premiered in 1955 by Women’s Korean Musical Group . Then the script of this theater has been lost. In 1987, this was re-staged to commemorate the anniversary of Yim, Chun Aeng’s Death, with the re-written script byHye Rhee Kim, the player as well as the director of Yeosung Gukgeuk. It was based on her own memories. Everything’s constituted with full of Mut(a sort of spiritual dandy)..with Mut. 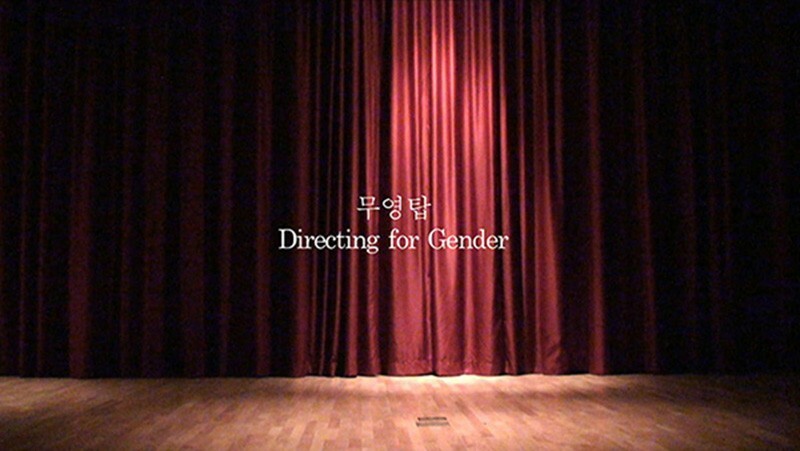 On the stage, for Yeosung Gukgeuk, male protagonist, he is really...especially... in this piece, soft and flexible. If you’re playing for other piece, step like strongly masculine, dance like this, but not do that in this stage. Totally, follow your heart, feel in your spirits! The male protagonist has to follow your heart, follow your eyes. That is the basic of male leader on the Yeosung Gukgeuk Theater. Always... after heart, after eyes. Like this, your body is just following after that. Yet, like this, without dandy, step, step, step... that is no way. Put the dandy. Dandy. Surely. Whenever you’re in the acting, your eyes, your heart, and your whole body should go to there, like be obsessed by someone. Male leader, including Asadal(the name of male leader in Mooyoungtab), has to express that. You, as a male leader, have to keep your dignity and unveil your dandy. I know it is very difficult. Moreover, in this play, Asadal needs more that. In others, there are many scenes of crossing swords.... women did that much well... they were amazing at the swords scene, it just looked like an impossible feat. The role like Joomong, Domyoungsungwang, should be really brave and active. Performances should be big and extreme.. roaring toward sky, drawing a bow and shooting an arrow to the full.... you know, with all his strength...yeh.. like this kind of protagonists have to get their vigor.. yet, not cool, if it is too much. Anyway, in this piece, Mooyoungtab, Asadal has to be soft and delicate, but, inside, contain hot and passionate heart like flame. Asadal is a very handsome and incredible talented artist. He is not that kind of role like competitive and aggressive. He is the person, like creating the Sukgatab and Dabotab (the name of Korean historical Buddhist tower) with firing his all of passion. The artistic attitude, the artistic spirits, these are all belong to Asadal. Well.... he is really mild and tender, but keep extremely strong responsibility as a creator of the towers. Though he has a wife, Gooseulagi(the name of female character) gives her heart to him, and come to him again and again. He is harassed by love and passion. His agony! He also loves her, but can’t express. The agony, it is this men’s dilemma. (song) Oh my gosh... laughing or crying... The clanging obviously means the towers I made with my best for three years beautifully established in center of Tohamsan. However it means also Gooseulagi going to be executed. The sounds are terribly sorrowful. Gooseulagi calls my name and sets herself on the fire as a way of showing her love. What can I do? Please stop clanging, oh.. I can never stand to listen. His wife was already drowned to death, his lover is now burning to death. He is totally going insane....gosh..
(sounds of Daegeum )...(crying..) Asanyeo..!